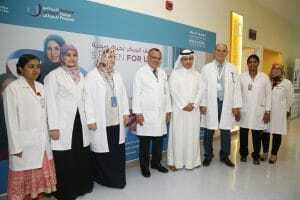 Qatar Cancer Society, in cooperation with the Primary Health Care Corporation, organized an initiative to encourage early detection of bowel cancer. HE Dr. Khalid bin Jabor Al Thani, Chairman of QCS, visited the early detection center at Labib Health Center, to do the early screening for bowel cancer, for men and women between 50 and 74 years old. The initiative was attended by Dr. Sheikha Abu Sheikha, Director of the Cancer Program at the primary health care Corporation – and a group of health sector leaders and a number of QCS honorary ambassadors. His Excellency Sheikh Dr.Khalid Bin Jabr Al-Thani said that this initiative for early screening is organized to spread the culture of cancer early detection, especially bowel cancer as it is one of the most common cancers in the State of Qatar. He thanked the PHCC and all relevant health institutions in Qatar for their cooperation and coordination in the health sector to make it easier for all individuals to carry out the required investigation. No one can work alone or in isolation from other institutions. The program welcomes the participants warmly, calling on citizens and residents to participate in the examination, especially as the process is very simple. Dr. Shaikha Abu Sheikha, Director of the Cancer Program at PHCC, said: “We are very pleased that the Qatar Cancer Society has been participate in this early screening program with the presence of His Excellency Sheikh Dr. Khalid Bin Jabor Al Thani, Chairman of the QCS, in supporting the early detection program for a healthy life. And we are happy to find all that support for our noble goals, and we emphasize that this will help us to highlight our mission to educate the widest possible audience.